Despite the fact that fraud only impacts a fraction of one percent of all purchases made with plastic, according to data from the Federal Reserve, it represents one of the biggest concerns among consumers. This can largely be attributed to the catastrophic impact of the worst-case scenarios that run through people’s minds as well as the notion that regardless of how low the incidence of fraud may be, no one wants to be the exception to the rule and find their hard-earned money siphoned away by criminals. What consumers generally do not know is that they are shielded from liability for unauthorized transactions made with their credit cards via the combination of federal law issuer/card network policy. As a result, financial institutions and merchants assume responsibility for most of the money lost as a result of fraud. For example, card issuers bore a 72% share of fraudulent losses in 2015 and merchants and ATM acquirers assumed the other 28% of liability, according to the Nilson Report, October 2016. The following statistics will give you a better sense of the credit card and debit card fraud landscapes as well as how both have changed over the years. During 2015 credit card and debit card gross fraud losses accounted for roughly 6.9₵ per $100 in total volume, up from 5.7₵ per $100 in 2014. 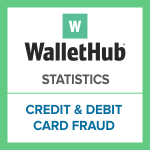 In 2015, US accounted for 38.7% of the worldwide payment card fraud losses but generated only 22.9% of total volume. Retailers incur $580.5 million in debit card fraud losses and spend $6.47 billion annually on credit and debit card fraud prevention annually. In 2011, 59% of the more than 37 billion debit card transactions that were made were verified by signature, 85% of all fraudulent debit card transactions involved signature “verification,” and $1.15 billion of the total $1.35 billion in debt card fraud losses (85%) stemmed from signature debit card transactions. Fraud against bank deposit accounts cost the industry $1.910 billion in losses in 2014. Debit card fraud accounted for 66 percent of 2014 losses. In addition to the estimated fraud loss amount, banks’ prevention measures stopped another $11 billion in fraudulent transactions. In 2015 the U.S. switched to EMV, which resulted in reduced existing card fraud. It also his drove a 113 percent increase in incidence of new account fraud, which now accounts for 20 percent of all fraud losses. Identity theft is a form of fraud that often results in unauthorized credit card and debit card transactions. In 2016, the number of identity fraud victims was at its peak in six years at 15.4 million, and the fraud losses resulting from identity theft amounted to 16 million a 6.7% increase from 2015. The majority of identity theft victims (86%) experienced the fraudulent use of existing account information, such as credit card or bank account information. *Note: These represent the total amount of credit card frauds reported by US consumers. Values reported by credit card issuers are much larger. How Quickly Will My Credit Card Company Remove Fraudulent Charges from My Account? What Should I Do If There is an Unknown Charge on My Account? What Do I Do if a Merchant Overcharged My Credit Card or Debit Card? With the advancement of technology comes increased responsibility on the parts of all to reduce credit card security breaches ultimately resulting in billions of dollars of credit card fraud annually. Specifically, MANUFACTURERS have the responsibility of creating secure machines requiring positive identity proof - I can't believe this technology is not available now - from the bearer of the credit card for pos, perhaps a fingerprint or voice recognition. STORE FRONT MERCHANTS should be required to look for positive identification of the bearer of the card and to keep the customers information secure. Also many stores have cameras at the register and this should be encouraged and increased to better apprehend culprits. ON LINE MERCHANTS need to install better security devices that would authenticate the purchaser, code words perhaps that only the true owner would know and have. POLICE DEPTS. AND ENFORCEMENT AGENCIES should move in FAST when complaints of credit card fraud or stolen credit cards are reported to more quickly and better apprehend the culprit. GOVERNMENTS need to issue stiffer penalties and harsher jail terms and fines for perpetrators of credit card fraud. CONSUMERS should do everything possible to keep their credit cards and personal information safe and secure, changing password frequently and being in communication with the providers of their credit cards and banks immediately on any suspicious activity. If all of these things were done and done with complete abandon, the billions of dollars wasted annually on credit card fraud could be put to better and more pro survival activities.